Olive Mae, 7 and half months (34 weeks):: This week Olive has had her third tooth (top) cut through and she's had a bit of a hard time with it. Though still grinning that goofy toothy smile she does. 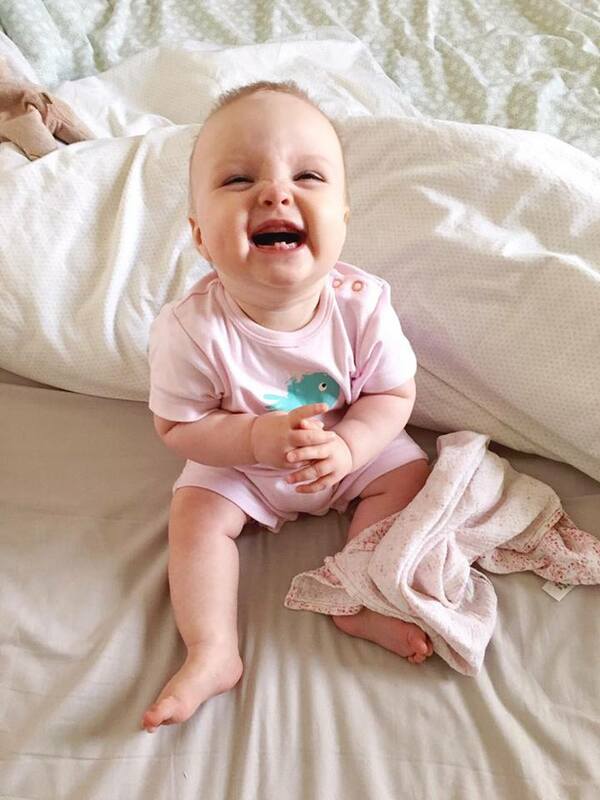 She is such a happy baby which makes the tough moments that much easier. This week Olive has also said "Dada". Even though I have encouraged her to say it, I admit I feel a little 'ugh' that it wasn't Mama. However her first ever sound was "Mamamamama" so I shall silently take that as her first word haha. Bless her. Also, this week we have had to lower the cot to the very lowest due to the little lady being an expert climber. Pulling herself up and trying to escape already! Bless her - she's so lovely. Aww what a little babe <3 this is making me broody! She's ready to go on an adventure! no boundaries for lady Olive!